My first radon test scored a 64pl so I knew I had to do something. 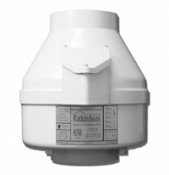 I found this web site that was very helpful in designing a system and buying parts for the Radon Mitigation System. I ended up capping the sump pump with lexan that I cut myself. Then I drilled holed in an inconspicuous area on the side of a house behind a bush for a vent. Then I drilled the concrete hole at about 7 inches from the foundation wall. I wanted to cut a hole in the drain tile but I knew that if I could not get to it it was not the end of the world. Fortunately I did find it and drilled a 2 inch hole in the drain tile and removed 5 gallons of stone. 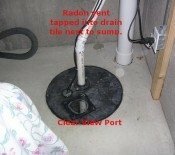 There was some water in the hole so I wondered if it was sufficient enough to get rid of the radon. I also used the RP145 fan. About 7 days after completion of the radon mitigation system I had another radon test done. The score was .7pl. That made me very happy. All of my work paid off. I must have saved on average $800. If you like doing projects this is a good one. Drilling the concrete hole was time consuming though. All in all it was worth it.